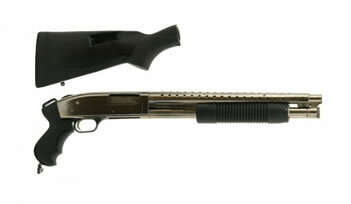 The Mossberg 500 shotgun is one of the most popular shotguns in North America and specifically in Canada. 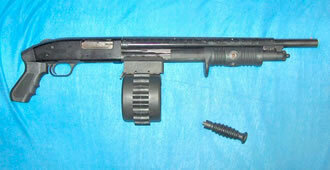 It is a tube-fed pump-action shotgun that is available in several different models and gauges. The Mossberg 500 is inexpensive and very, very dependable pump shotgun that was first devised and produced by O.F Mossberg and sons shotguns. It comes in many variations including the Persuader, the Mariner, all of which are available in Canada. It is considered to be a direct competitor of the Remington 870. It comes in 4 variants which are largely indicative on the gauge required by the end user. The Mossberg 500A , the Mossbrg 500B, the Mossberg 500C and the 500D. The Mossberg 500 is non-restricted and is for sale in canada. We will be a seller of this fine and inexpensive shotgun as soon as we secure government approval and distribution. With a magazine that is illegal in Canada. Mossberg Silver Reserve - see our article about the silver reserve. Buy the Mossberg Silver Reserve in Canada. The Silver Reserve shotgun is a side by side shotty that comes in many flavors. We will have it for sale ASAP. Click on a link to read more about these great guns. Parkerized versions of this gun are available.